An ophthalmologist is an eye doctor who has specialized in the field of ophthalmology. Ophthalmologists are licensed medical or osteopathy doctors who upgrade their training in order to diagnose the various eye disorders that are known to affect the entire visual system. Some of the procedures they perform include: eye surgery, screening, treating eye diseases, eye examination and prescription of eye glasses and contact lenses. The process of becoming an ophthalmologist is known to be lengthy, since it involves twelve years of training and can be longer if an individual pursues various subspecialties. The subspecialties involve specialization in specific eye care areas such as retinal diseases and paediatric ophthalmology. People interested in pursuing a course in ophthalmology are required to attain a four year training in college, a degree in medicine which involves a four year training in a medical school, one year for clinical training and a three year hospital based training in ophthalmology. Trainees who complete their training are required to be board certified, that is to obtain a license that authorizes them to operate as ophthalmologists. Certification differs in various states hence it’s highly recommended that one should be well informed on the current details. An ophthalmologist job tasks involves managing both medical and psychological ophthalmic conditions. They also assess and examine the visual system of the patients in order to make a diagnosis. 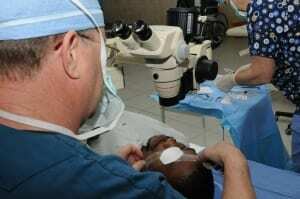 They carry out surgical procedures like laser surgery and small incision surgery in order to treat eye diseases such as cataracts and glaucoma. An ophthalmologist is also authorized to carry out tissue biopsy and use various therapeutic procedures like the laser therapy. He or she also gets to manage disorders like diabetes, genetic disorders or neurological disorders that affect the vision of a person. In addition, ophthalmologists work together as a team with other specialists, including ENT surgeons and neurologists in order to make informed decision on various medical conditions. https://sydneyeyehospitalfoundation.org.au/wp-content/uploads/2018/06/sehf-logo-8-2.png 0 0 SEHF https://sydneyeyehospitalfoundation.org.au/wp-content/uploads/2018/06/sehf-logo-8-2.png SEHF2012-12-07 10:00:002018-11-13 15:40:05What Does An Ophthalmologist Do? An ophthalmologist is an osteopathic doctor, who has specialized in eye care. They do not only deal with the eye but also deal with other visual passageways, the brain and other areas around the eyes. They are fully licensed to perform eye surgery for corrective measures and to also examine, diagnose and treat various eye disorders such as glaucoma, retina disease or cornea diseases. Moreover, they are authorized to prescribe medications, eyeglasses and contact lenses. Here are the various factors people should consider when choosing an ophthalmologist for eye care services. The eye doctor should have an educational background and the required credentials such as a license of practice. A fully accredited ophthalmologist must have undergone four year training in college, four years of medical training, one year internship and a hospital based residency in ophthalmology for a minimum of three years. In order to be sure that he or she has these requirements, patients should check on the Australians ophthalmology website for clarification. The next factor to consider is experience, most people prefer experienced personnel since they are proficient in various procedures and diagnoses of eye conditions. Choose an eye doctors who has handled volumes of procedures and has been in practice for many years. This is recommended since such professionals are able to identify eye disorders and resolve them appropriately. Select a doctor who offers the best patient care. Check the doctor’s advertisements and confirm with other clients who have been treated by him or her. Ask about the technology used, whether he or she is conservative in eye treatment and the type of care provided; whether it is pre-operative or post- operative. Etiquette and convenience is also an important factor. This can be analysed through the treatment you receive from both the doctors and the employees from the eye care centre you approach. Lastly ensure that the cost is affordable and also the ophthalmologist accepts insurance participation. Who is an Ophthalmologist Sydney? An Ophthalmologist Sydney is an eye specialist who is specialized vision and eye care in Sydney, Australia. Unlike the other eye care providers in Sydney, ophthalmologist professional skills are aimed at providing full eye health and eye care programs. Ophthalmologist’s knowledge and skills are extended far beyond normal eye care and treatment. They include scientific research aimed at revealing the causes of eye problems as well as eye treatment options. Ophthalmologist Sydney should be viewed differently when compared to optometrist Sydney. The manner in which an ophthalmologist is trained on eye diagnosis and treatment in Sydney differs from the manner in which an optometrist or optician is trained. Therefore, an ophthalmologist is fully trained individual who is licensed to practice eye diagnosis, eye treatment and eye surgery. The educational qualifications of an ophthalmologist in Sydney include: four year college training; for year training in a licensed medical institution; a year of medical internship; and a minimum of three years hospital-oriented training on eye disorder diagnosis, eye disorder surgery and eye disorder treatment. Ophthalmologist Sydney constitutes trained specialists in the following fields: general ophthalmology; medical retina; corneal transportation; refractive surgery; glaucoma; laser eye surgery; cataract surgery; and LASIK. These are the commonest fields which ophthalmologists in Sydney, Australia deal with every now and then. All the ophthalmologists are highly qualified and they also have reputable back grounds on procedures which they have carried out on their patients. Ophthalmologist Sydney focuses on means and ways of repairing as well as restoring any individual Australian eye sight. Ophthalmologists in Sydney are constantly working on mechanisms of carrying out both functional and cosmetic development of the eyes. This development involves eye treatments and surgeries of different kinds. The treatments and surgeries are structured to produce realist results on the optimal individual eye health. The best medical facility offering eye treatment and vision care in Australia is Sydney Eye Hospital. The hospital is well-equipped with the latest facilities and technology on eye health. In fact, they have the best team of ophthalmologists in Sydney. Ophthalmologists from the Sydney Eye hospital are so far the best ones to consult while in Sydney, since they are not only qualified but also very successful in all the eye procedures they have performed. https://sydneyeyehospitalfoundation.org.au/wp-content/uploads/2018/06/sehf-logo-8-2.png 0 0 SEHF https://sydneyeyehospitalfoundation.org.au/wp-content/uploads/2018/06/sehf-logo-8-2.png SEHF2012-07-13 10:00:002018-11-13 21:17:54Who is an Ophthalmologist Sydney? An ophthalmologist Sydney offers the most outstanding eye treatment and eye surgery services. A conclusive classification of all the ophthalmologist services includes the following. LASIK and laser eye surgery: the two eye treatment options offer faster patient recovery. Primarily, both LASIK and laser eye surgery represent the most advanced technology as compared radial keratotomy. Ophthalmologist Sydney also offers reliable services on the following: cataract surgery-a procedure of removing the cataract; eye surgery-a procedure performed on the eye also known as ocular surgery; treatment of glaucoma-a disease of the eye that presents adverse effects on the optic nerve; refractive surgery-a procedure tailored towards improving the refractive state of one’s eyes as well as reducing dependency on eye glasses; cornea transplant; and ophthalmology. An outstanding ophthalmologist Sydney must be in the position of administering the above eye treatment options and eye surgery procedures. The ophthalmologist you settle for should be able to offer eye treatments and surgeries that are basically developed to produce the most exceptional results and improved eye health. Moreover, the ophthalmologist should have the capacity of handling the following procedures incorporated with the ones mentioned above orbital procedures; lacrimal procedures; and cosmetic procedures. A reliable and very effective ophthalmologist Sydney must be able to carry out a series of tests in order for him or her to establish the proper basis of your optical health. The ophthalmologist must have the capacity of carrying out an external examination on the various parts of your eyes, including: cornea, eyelids, pupil operation, eye movement, sclera, and visual acuity. Through the above tests, the doctor will be able to establish your eye sight strength. Currently, the best ophthalmologist Sydney is found at Sydney Eye Hospital. At this hospital, your eyes will undergo the utmost care that you will always admire. According to the ophthalmologist and other specialists at Sydney Eye Hospital, you should never think to twice to have your eyes checked for any abnormalities. The specialists from this hospital will ensure that the final results of your visit have determined the most recent status of your optical health without leaving any details off the record.